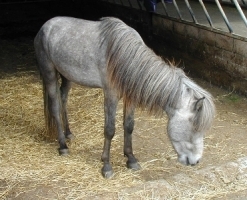 Hofsi is a grey Icelandic gelding born in 2003 at Pentland Hills Icelandics, Carlops. In 2005 he developed chronic equine grass sickness and the terrible story of how he fought this disease and lingered between life and death for weeks, is written up in the PHI website (www.phicelandics.co.uk). 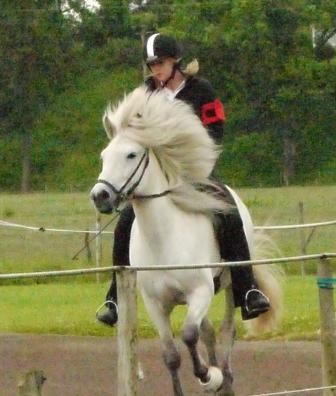 Hofsi has continued to mature and behave normally over the years and has become a lovely horse to ride and handle. So much so that we recently decided to put him in to the British Championships for Icelandic horses held on 24th/25th June at West Tarf, West Linton. This is an international qualifier for the World Championships to be held in Austria this year. As he has never been on an oval track and competed before, we entered him in the novice four gait class. It so happened that his dam Alfta from Pentland Hills was also competing against him which added a bit of extra excitement to the day! From keen competition to family fun – my granddaughter Lauren who is 8 years old has started riding him in the hills about the farm. He is so gentle and considerate when she is on board and lowers his head for her to put on his bridle. Hofsi will always be a very special horse for us.